Review posted March 24, 2018. Eerdman’s Books for Young Readers, 2017. 32 pages. I have a thing for books where someone gets eaten – or eating gets thwarted. 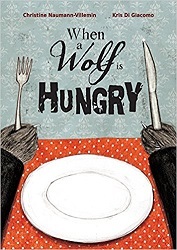 When a Wolf Is Hungry falls into the latter category. So Edmond heads into the city. He stopped in front of a tall apartment building. Oh, Edmond was so happy! he pressed the button for the elevator. Inside the elevator, he set down the knife and adjusted his bow tie. But of course, he forgot his knife in the elevator. A turkey finds the knife in the elevator and says it’s just what she needs to cut this cake. So when Edmond comes back, it’s gone. So he returns to try again with a chainsaw – and a bear asks to borrow it to trim a hedge on the roof. Similar fate befalls a rope, a big pot, and his barbecue grill. That one is borrowed by a lovely young wolf who thinks he’s a new neighbor. When he’s had too much and decides to just eat the rabbit with some mustard, there’s a note on the rabbit’s door saying “I’m on the roof.” When the wolf reaches the roof, he finds all the apartment residents he encountered before, including the lovely young wolf. He finds out why they wanted to borrow his things – and let’s just say he makes some new life choices. This one isn’t laugh-out-loud funny, but it’s understated and lovely and a happy ending for everyone.